Need help? Be sure to check here for answers to your questions! I'm interested in buying a mute for my trumpet. What's the best one to buy? The Straight Mute DW5504 is designed to give the typical muted sound that is used in the symphony orchestra or big band. It projects very well, and is noted for its excellent intonation. 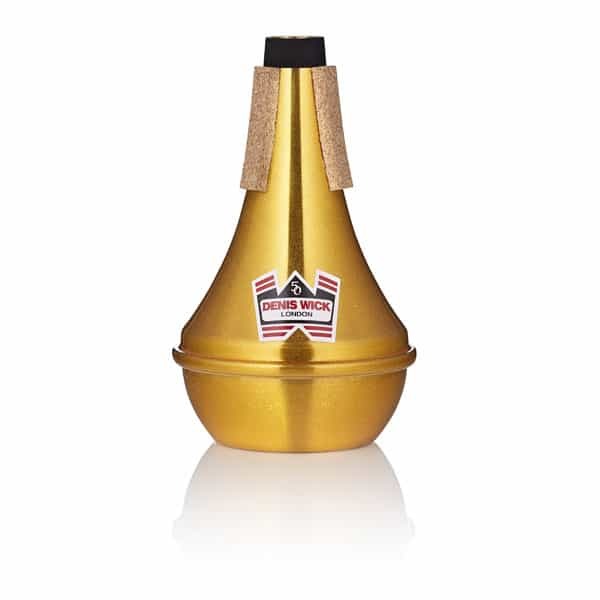 The Practice Mute DW5526 is almost silent and is designed for use in hotel rooms or for warming-up at a rehearsal. Because has a lot of resistance it is also very good for developing good breath support, and thus a useful teaching aid. It is too soft to use in performance, unless you want a sound that is almost inaudible! We can also recommend our new Wooden Mute DW5551 which works very well at lower dynamics, for instance when accompanying voices, and has a more 'organic' sound. Our ET Mute DW5506 gets closest of any mute to the original Miles Davies sound, and works equally well with the tube in and the tube out. For variations on the straight mute sound, try our copper-bottomed Straight Mute DW5504C or the brass-bottomed Straight Mute DW5504B. The brass is slightly brighter in tone than the pure aluminium, and the copper a little darker. I play the trumpet and I have problems playing high notes in my big band. Should I get a smaller mouthpiece? A trumpet mouthpiece with a shallower cup and smaller bore will give a brighter, more scintillating sound and will help the production of high notes. It is important to note that you will also need to develop good breath support and a strong embouchure, which can only be achieved by regular practice. The best mouthpieces for playing lead trumpet are the Classic 3E, 4E and 5E. The 3E has a cup diameter of 16.75mm, the 4E is 16.50mm and the 5E is 16.00mm. The Denis Wick range of trumpet mouthpieces includes some of the best-designed ‘screamer’ mouthpieces available. How do I choose the best mouthpiece for my instrument? It is important that the mouthpiece fits the instrument correctly. Make sure that it protrudes the correct distance (i.e. it does not go in too far or stick out too much) and that it fits snugly without wobbling in the instrument. If it fits correctly, the open octaves on the instrument should be absolutely in tune. If the upper octave is flat it could indicate that that the mouthpiece is protruding too far. If the mouthpiece wobbles it could indicate that that the mouthpiece taper is wrong for your instrument. Bear in mind that European tapers sometimes differ from American tapers. Hence a mouthpiece designed for an American instrument might not fit correctly in a German instrument. The cup size should be appropriate to the size of the instrument; do not try to use a mouthpiece with a large, deep cup on a small instrument and vice versa. If in doubt, study our website to find the best mouthpiece for your style of music and your instrument. It is always best to try a mouthpiece before you buy it so that you can find exactly the right one that will bring the best out of your instrument and your playing. I want to be able to play louder. Should I get a bigger mouthpiece? A bigger mouthpiece can help achieve more volume. Make sure that your breath support is good, that your throat is open and your embouchure is not too tight. 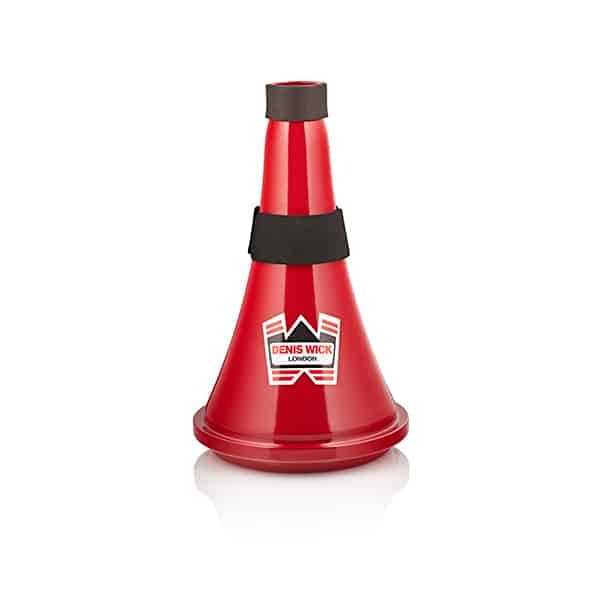 This should help you play louder without having to buy a new mouthpiece. However, a mouthpiece with a bigger throat allows you to put more air through the instrument. 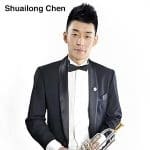 For instance a Classic Trombone 6BL has a bore of 7.00mm, whereas as a 5AL has a bore of 7.30mm, allowing more air to pass through the mouthpiece, which contributes to making a more powerful sound. The bigger cup diameter of the 5AL (25.73mm compared with 25.40mm) allows more lip to vibrate which makes for a fatter, richer sound, which again will contribute to the overall volume. Bigger mouthpieces can be harder to play, but generally produce better dynamic results. Another tip for developing loud playing: try practising with a Denis Wick Practice Mute. These are high-resistance mutes and, when used correctly, make the player support the sound properly and open up the throat spaces, producing a more powerful and open sound. 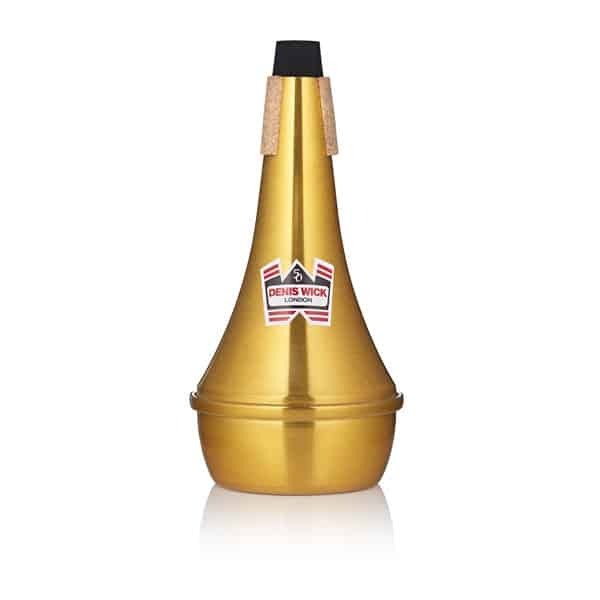 Practice Mutes are available for every instrument from tuba to piccolo trumpet. I have a mouthpiece which came with my trumpet, but I don’t find it very comfortable. Should I change it for something different? Instruments are generally supplied with standard mouthpieces. The problem is that players are not standard. A player with thick lips might look for a mouthpiece with a wider rim to give more support. Someone with thin lips might prefer a mouthpiece with a slightly narrower rim. If a player makes a naturally very fat sound, they might seek out a slightly brighter-toned mouthpiece, whereas a player with a naturally brilliant sound might want to darken his tone slightly. So it is best to find the mouthpiece which suits you perfectly as soon as possible. Try out a few until you have found the best one for yourself, and once you have found it, stick with it! Denis Wick offers a huge variety of mouthpieces, so you should be able to find one from our range which suits you perfectly. Some players say gold mouthpieces are better. Denis Wick mouthpieces have the best gold-plating available. 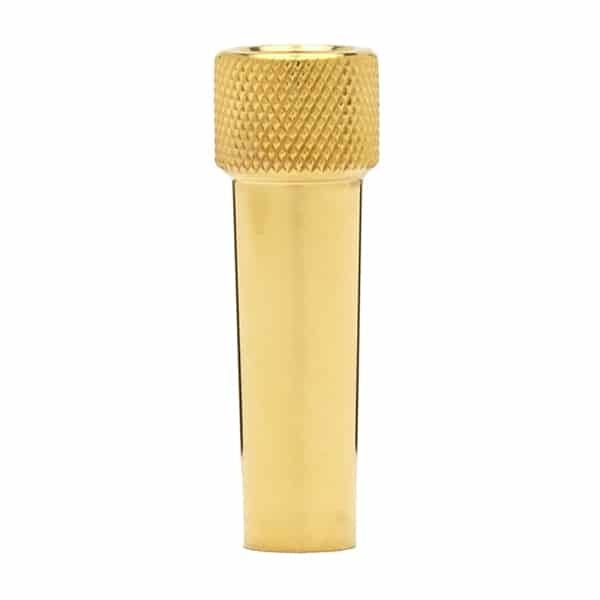 The mouthpieces are plated with a heavy gold deposit of no less than three microns thickness. The gold used is 22 carat and produces a beautiful playing surface and a wonderful, rich colour. The gold gives brass players extra flexibility in their performances. If you have a polished silver instrument nothing looks better than a gleaming gold mouthpiece! Gold is a soft metal, so if you have a gold mouthpiece make sure it is protected at all times. 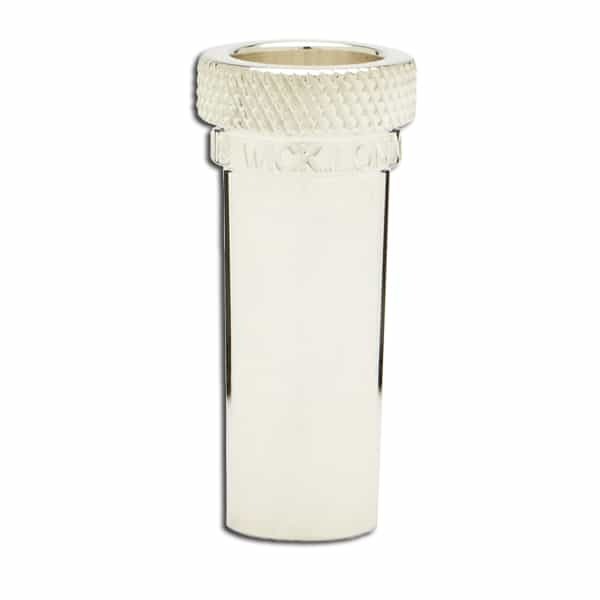 Buy a Denis Wick leather mouthpiece pouch, such as DWA221L for trumpet, to keep the mouthpiece safe when not in use. Never use any abrasive to polish the mouthpiece. Warm, soapy water, a soft cloth and a mouthpiece brush are all you need to clean a gold mouthpiece. The gold never corrodes and never needs polishing.